« Review: HTC Tattoo (vs HTC Hero) – Android's mass-market future? It seems a bit early to be talking about an event that doesn’t take place until April next year, but I wanted to give UK readers a quick heads up that The Gadget Show Live 2010, which takes place from 8 to 11 April, is currently running a pre-Christmas promotion. The expo is a spin-off of the popular Channel Five TV show of the same name and takes place at the NEC in Birmingham. 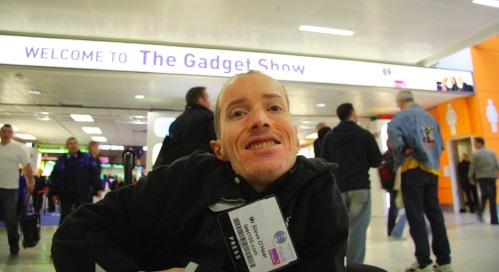 This year’s The Gadget Show Live was a lot of fun and I got up close with products from Sony, LG Mobile, Flip, Swap, BeBook, and more – shooting some video along the way. Hopefully, we’ll be able to do the same again next year. I’ve already bagged a couple of press passes so with a bit of luck (and budget) we should be good to go. Talking of budget, here’s how to qualify for that early bird discount. Go to www.gadgetshowlive.net and insert the code VH22 for the special £11.95 Christmas discounted ticket, available only until 24 December 2009. Apparently 36,000 tickets have already been sold (around 50,000 is the capacity over the four days) and that Saturday is already fully booked. One of the first products that I got to check out at The Gadget Show Live last week was the Mino HD from Flip. The updated version of their popular ‘point and shoot’ camcorder – a product category that the company practically invented – supports 720p HD video (H.264) and has 4GB of on-board memory (non-expandable), which provides enough storage to shoot about an hour’s worth of footage. This is a product category that has me far from convinced but it’s intriguing nonetheless. I’m talking about mobile phone watches, which are about as Star Trek or Knight Rider as they come. I got to see two such devices up close (to varying degrees) at The Gadget Show Live. I’ve got to hand it to the guy from LG’s stand at The Gadget Show Live, if it wasn’t for his genuinely enthusiastic pitch for the company’s new ‘Arena’ KM900 touch screen phone, I might too easily have dismissed it as just the latest iPhone wannabe.